Pretty steamers of are pictured as active bright Green Aurora bands dance above the evening sky. [Aurora Activity?]. Airborne from 36,000 feet over the North Atlantic Ocean. 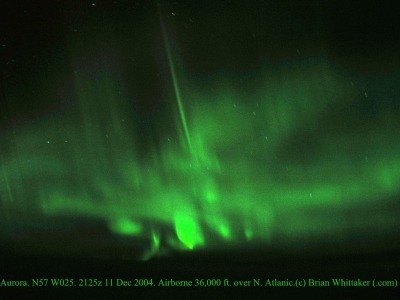 2125GMT 11 December 2004. [400x300].